Kids in this age group are concerned about fitting in and being accepted by their peers. Although there’s healthy competition between them the need to be cool in front of their friends is important, too. Give them a little help by making their birthday cake really special, but not too outrageous! 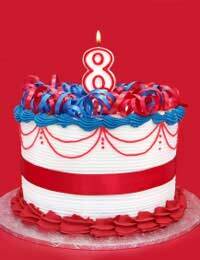 The first simple idea for an 8-year-old’s birthday cake is to make two round cakes and stick them together with butter cream to form the shape of a number 8. Fill with jam. Cover the cakes with butter cream first, then, with rolled sugar paste and decorate according to their interests and what they’ve been doing on the day. If you are unsure about what theme, if any, to use for your child’s cake, why not make one with a message? Cut both sections of cake in half horizontally and fill with butter cream or jam.Glue the quarter slice on top of the main cake piece with butter cream to form a sofa or ‘L’ on its side shape. Next, place the cake on a cake board and cover it with a layer of butter cream, then, readymade black sugar paste (follow instructions on package. )Use a pastry brush to moisten the cake board around the black area and cover it with strips of white or green sugar paste. For each figure use about 50g sugar paste rolled into a cone shape. Keep the top flat for the head to sit on. Make the heads by rolling about 15g sugar paste into a ball then brush a little water onto the top of the cone shape and stick the head on. Make hair and/or caps with strips of sugar paste. For the noses and ears, roll tiny balls of sugar paste and stick them on with a brush of water. You have now made your back row. Make an arm for each end figure by rolling 5g of sugar paste into a sausage shape. Make more figures for two rows in front of this one, alternating hair colour and clothes if theyare not all wearing team kit. The front row is the only one that needs legs, arms, hands and feet. Roll black sugar paste into balls to make boots and stick a little white sugar paste across the top to look like socks.Make legs and hands with flesh-coloured sugar paste and stick on with a brush of water. Shorts can be made using the same method but a different colour. The finishing touches are up to you-add a football/basketball/cricket bat if appropriate and personalise the individuals if you dare!